I got a letter in the mail today (well, technically, Brian got it, which still gets my goat*) from GM about a condition on some 2006 Pontiac G6 vehicles. The electric power steering goes out. My car has had that condition for several years now. I crank up the car, the car beeps for a few seconds, then a display on the dash says “Power Steering.” Until the power steering actually started locking up, I never did anything about it. Over the last 6 months, it started locking up more frequently, so I knew I needed to part with my cash and finally get it fixed. I got it fixed in July. That’s a story for another day about picking up the car, feeding a toddler and a newborn and selling the house. Sounds exciting, huh? Along with getting the steering column replaced, they also worked on the tie rods. Again. Let’s see, and before that, it was replace the tie rods, replace the interior headliner, replace the interior sun visors, replace the battery (less than a year old doing freaky, random things like the clock resetting, changing from CD player to radio, alarm goes off, doors lock and unlock), and replace the interior headliner pins. None of these things sounds like a big deal, but that’s a lot of trips to the mechanic on a brand new car. Granted, my car is no longer brand new, but everything until now had been covered under the warranty. I’m not even counting normal things like tires or oil changes. *Brian’s name is registered to the G6. I got news for you, GM: I picked the car, I negotiated the deal on the car, I wrote the check for the car, I drive the car…it’s my car. My husband doesn’t like my car. Why is my husband’s name on all correspondence? Because he’s a guy? Grrr. That really gets my goat. Parents are People. 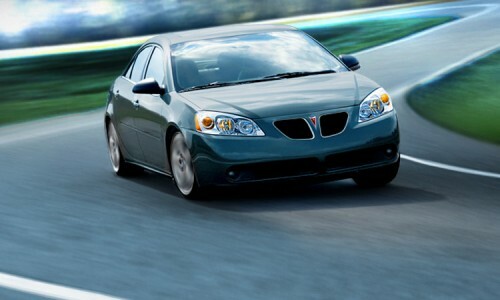 Driving a Pontiac made me a GM-hater, too. If you cannot build electric windows, then do not put them in your designs! My Audi is expensive to fix, but at least the Audi place sends the correspondence directly to me. Newsflash, the next car we bought was a GMC Yukon, another American car. While I do agree that the build quality on Janie’s G6 is horrible, my Yukon doesn’t exhibit these problems and it’s only one year newer than her car. My 2000 S10 hasn’t been a bad purchase either. I don’t think it’s fair to lump all American cars (or GM for that matter) in the same category. LOL. No really, I LOLed. I don’t think “Buying American” ever entered our minds as a reason for the G6. Janie refused–as in, wouldn’t even go to the lot–to even test drive a Camry or an Accord. Was it because those are Japanese brands? No. It was because everyone else drives a Camry or an Accord. Never mind that everyone drives them because they’re insanely reliable. I know I argued that point many times. However, it was going to be Janie’s car, so she had the final decision. Instead we test drove a Volvo, a Volkswagen and a Pontiac. I think we got what we asked for and I’m thankful we didn’t go with either of the other two. At least parts for American cars are cheap.